legX is a revolutionary knee exoskeleton that allows the wearer to squat repeatedly or for prolonged periods of time by reducing the knee joint and quadricep muscle forces. The amount of support can be adjusted to suit the needs and weight of the user. The legX is offered with a custom work boot to maximize user comfort. This intelligent system can distinguish between walking, ascending/descending stairs and squatting to allow unimpeded locomotion and only provides support when support is desired. legX also has a locking mode, where the exoskeleton can be used like a chair. An anthropomorphic profile and adjustable sizing allows for natural movement and intuitive awareness of one’s position within tight spaces. legX moves freely with a worker without impeding the wearer while providing support during squatting tasks. legX can be used with tool belts allowing workers’ normal equipment to retain its existing functionality. legX can be used in combination with backX to provide additional support and is part of the entire MAX system when combined with the backX and shoulderX. Reduces Knee Fatigue and Forces: Substantially reduces effort of the knee muscles, thus reducing knee joint force. Intelligent: Can distinguish between walking, ascending/descending stairs and squatting to allow unimpeded locomotion and only provides support when support is needed. Zero Impedence: legX does not impede common day-to-day activities such as ascending and descending stairs, and even driving or biking. legX moves freely with a worker without impeding the wearer while providing support during squatting tasks. Comfortable: An anthropomorphic profile and adjustable sizing allows for natural movement and intuitive awareness of one’s position within tight spaces. Works with Existing Gear: legX can be used with tool belts and safety harnesses allowing standard worker equipment to retain its existing functionality. Compatible: legX can be used in combination with backX to provide additional support and is part of the entire MAX system when combined with the backX and shoulderX. Adjustable Support for the User: The amount of support can be adjusted to suit the needs and weight of the user. Lightweight: Pair of legs weigh 13.7 lbs (6.2 kg). The weight of the device is not borne by the user. Adjustable Size: legX is adjustable to various sizes and can be worn all day. 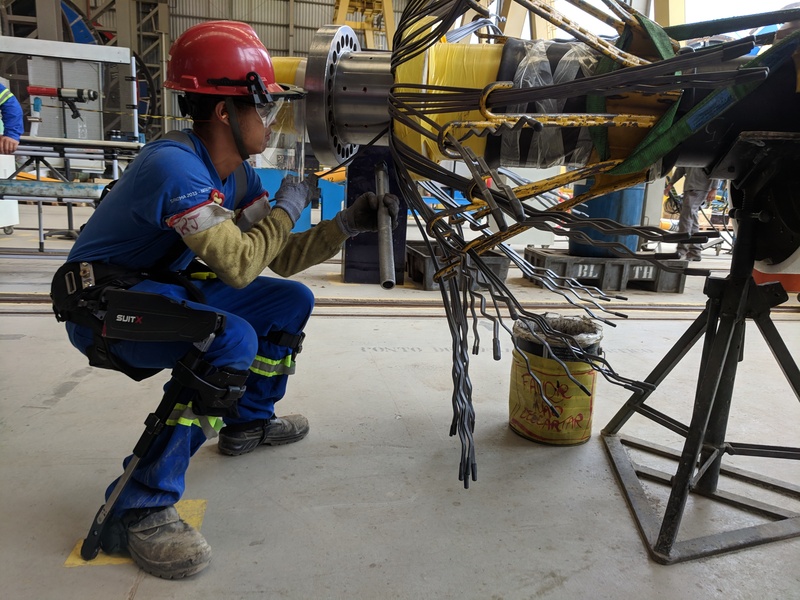 Workers in jobs with a high risk of knee injury share common experiences; they all perform repetitive squatting or endure prolonged periods of time in a squatting posture. legX is designed based on solid engineering foundations at the University of California, Berkeley and suitX with close attention to workers’ needs and feedback. legX have been used in numerous industrial applications as shown below.